Faced with foreign carmakers launching new lineups and conducting aggressive sales promotions to increase market share, Renault Samsung Motors is upbeat about its future. In April, the company set a new record by selling 12,542 cars, up 15.4 percent year-on-year. Domestic sales were up 35.7 percent at 6,153 in the same period. 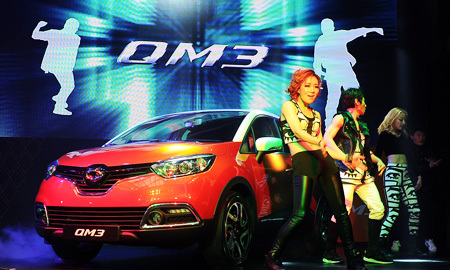 Renault Samsung Motors' new crossover utility vehicle, the QM3, alongside the QM5 Neo and SM3 Neo, has been pushing up the automaker's sales.